To copy a DVD-5 movie to an ISO image file on hard disk with Any DVD Shrink, follow the steps below. 1. Insert the DVD-5 movie to a DVD drive. 2. Run Any DVD Shrink, click Open DVD button, then Any DVD Shrink will list all the contents of the DVD-5 movie in the main window. And Any DVD Shrink will show you whether the DVD movie is NTSC or PAL. Also the longest title will be pointed out. 3. Go to menu Settings --> Options, and select 4400 (DVD D5) in Max DVD Size dropdown list. 4. In output device dropdown list, select ISO Image File as output medium. 6. Click Copy DVD button and Any DVD Shrink will start to convert the DVD-5 movie to an ISO image file. a. 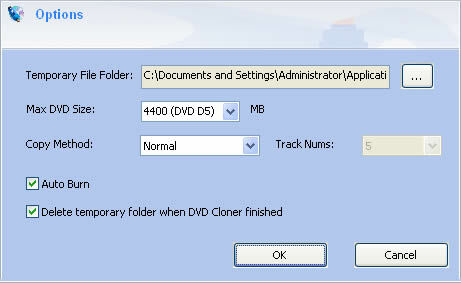 Check Delete temporary folder when DVD Cloner finished option to save hard disk space. b. If you don't uncheck any items from the source disk, the ratio of DVD and ISO image will be 1:1.
c. You can uncheck any chapters, titles, subtitles or audio tracks that you don't want to be included in the ISO image file. d. An ISO image file can be easily burn to a blank disc with various burning programs. e. Please notice that hard drive in FAT32 format can't hold a file bigger than 4G while NTFS format can. In this case, you need to convert FAT32 format to NTFS format. ---- A DVD decrypter tool is used to create disc images or DVD folders with the same structures as DVD-Videos. DVD copy protection like Macrovision, CSS, region codes and user operation prohibition can be also removed by a DVD decrypter. ---- A DVD shrink tool is usually used to shrink a commercially-released dual layer 8.5GB DVD to a single layer 4.7GB DVD. A DVD shrinker usually re-encode the movie in lesser quality, or discard unnecessary content in order to fit on the single layer DVD-5 discs. ---- A DVD ripper is a software application that copies the content of DVDs to a hard disk drive, through a process called ripping. DVD rippers are used to transfer formats, to edit or back up DVD content for playing on mobile devices or media players.